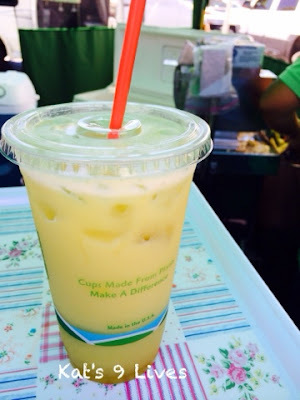 For those who have not tried sugarcane juice, you are really missing out! Asians love drinking the juice and also the gnaw on the actually sugarcane as a snack. There are many different types of sugarcane around the world. I was intrigued to find a Raw Sugarcane Juice stall at the Farmer's Market near the OC Mix. It was the last stall closest to the entrance to the OC Mix. 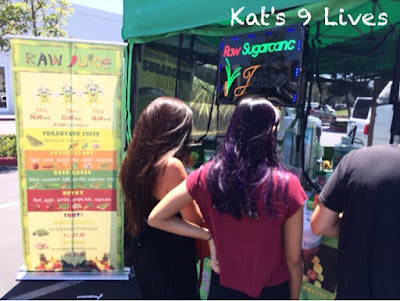 They offer many options of adding kale, ginger, kumquat, and more to the drink. Personally, I love just pure sugarcane juice. Any other fruit or vegetable you add will change the flavor completely. If you have never had sugarcane juice, I recommend trying it pure to get a sense of the taste and in the future add other components. Most Asian places add kumquat to the juice. They actually have a banner that listed the healthy qualities of drinking sugarcane, which I was very surprised. Now I can use this as an excuse to continue drinking the super sweet sugarcane juice. They use pretty good sugarcane as it was refreshingly sweet. I'd definitely come back to this stand for another drink!